An international team led by researchers from Tohoku University has found an extremely faint dwarf satellite galaxy of the Milky Way. The team's discovery is part of the ongoing Subaru Strategic Survey using Hyper Suprime-Cam. The satellite, named Virgo I, lies in the direction of the constellation Virgo. At the absolute magnitude of -0.8 in the optical waveband, it may well be the faintest satellite galaxy yet found. Its discovery suggests the presence of a large number of yet-undetected dwarf satellites in the halo of the Milky Way and provides important insights into galaxy formation through hierarchical assembly of dark matter. Currently, some 50 satellite galaxies to the Milky Way have been identified. About 40 of them are faint and diffuse and belong to the category of so-called "dwarf spheroidal galaxies" (Figure 2). Many recently discovered dwarf galaxies, especially those seen in systematic photometric surveys such as the Sloan Digital Sky Survey (SDSS) and the Dark Energy Survey (DES) are very faint with absolute luminosity in the optical waveband below -8 magnitude. These are so-called "ultra-faint dwarf galaxies". However, previous searches made use of telescopes with a diameter of 2.5 to 4 meters, so only satellites relatively close to the Sun or those with higher magnitudes were identified. Those that are more distant or faint ones in the halo of the Milky Way are yet to be detected (Figure 3). The combination of the large aperture of 8.2-meter Subaru Telescope and the large field-of-view Hyper Suprime-Cam (HSC) instrument is very powerful in this study. It enables an efficient search for very faint dwarf satellites over large areas of the sky. The first step in searching out a new dwarf galaxy is to identify an over density of stars in the sky, using photometric data. Next is to assess that the over dense appearance is not due to line-of-sight or accidental juxtapositions of unrelated dense fields, but is really a stellar system. 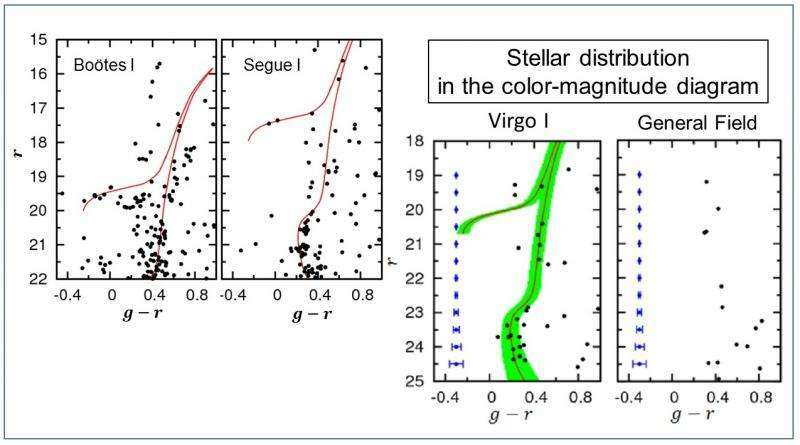 The standard method for doing this is to look for a characteristic distribution of stars in the color-magnitude diagram (comparable to the Hertzsprung-Russell diagram (middle and left panels of Figure 4)). Stars in a general field shows no particular patterns in this diagram (right panel of Figure 4). Daisuke Homma, a graduate student at Tohoku University, found Virgo I under the guidance of his advisor, Masashi Chiba, and their international collaborators. 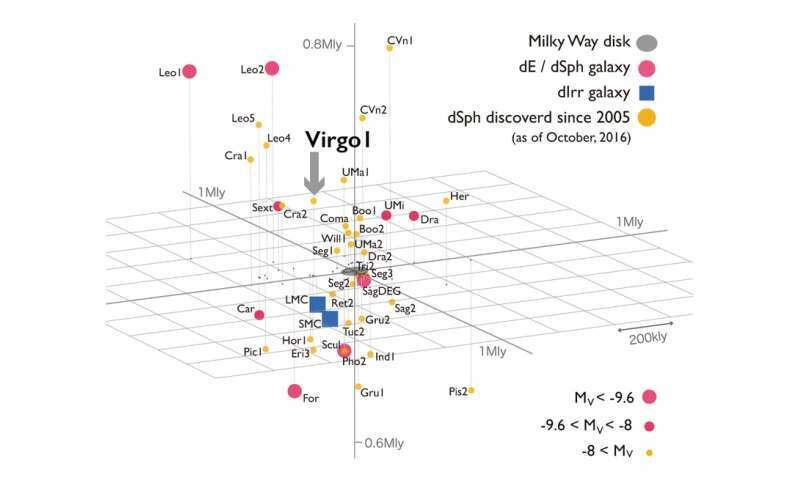 "We have carefully examined the early data of the Subaru Strategic Survey with HSC and found an apparent over density of stars in Virgo with very high statistical significance, showing a characteristic pattern of an ancient stellar system in the color-magnitude diagram," he said. "Surprisingly, this is one of the faintest satellites, with absolute magnitude of -0.8 in the optical waveband. This is indeed a galaxy, because it is spatially extended with a radius of 124 light years – systematically larger than a globular cluster with comparable luminosity." The faintest dwarf satellites identified so far was Segue I, discovered by SDSS (-1.5 mag) and Cetus II in DES (0.0 mag). Cetus II is yet to be confirmed, as it is too compact as a galaxy. Virgo I may ultimately turn out to be the faintest one ever discovered. It lies at a distance of 280,000 light years from the Sun, and such a remote galaxy with faint brightness has not been identified in previous surveys. 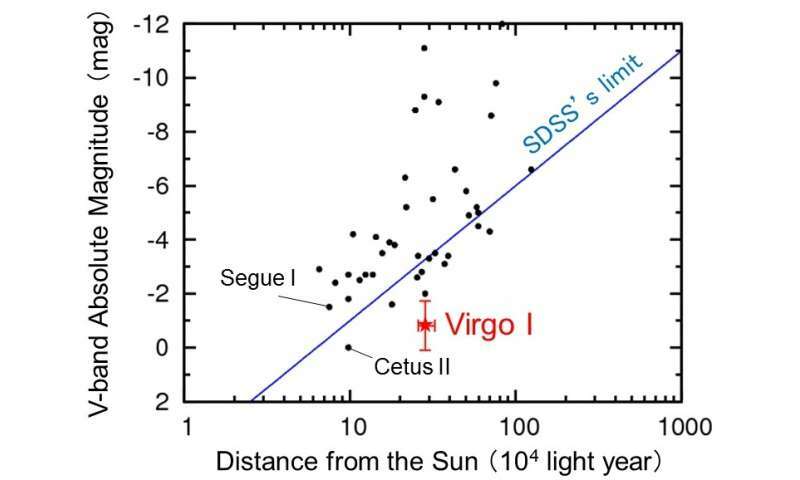 It is beyond the reach of SDSS, which has previously surveyed the same area in the direction of the constellation Virgo (Figure 5). Figure 2: Satellite galaxies associated with the Milky Way Galaxy. Squares are Large and Small Magellanic Clouds and circles are dwarf spheroidal galaxies. According to Chiba, the leader of this search project, the discovery has profound implications. "This discovery implies hundreds of faint dwarf satellites waiting to be discovered in the halo of the Milky Way," he said. "How many satellites are indeed there and what properties they have, will give us an important clue of understanding how the Milky Way formed and how dark matter contributed to it." Formation of galaxies like the Milky Way is thought to proceed through the hierarchical assembly of dark matter, forming dark halos, and through the subsequent infall of gas and star formation affected by gravity. Standard models of galaxy formation in the context of the so-called cold dark matter (CDM) theory predict the presence of hundreds of small dark halos orbiting in a Milky Way-sized dark halo and a comparable number of luminous satellite companions. However, only tens of satellites have ever been identified. This falls well short of a theoretical predicted number, which is part of the so-called "missing satellite problem". Astronomers may need to consider other types of dark matter than CDM or to invoke baryonic physics suppressing galaxy formation to explain the shortfall in the number of satellites. Another possibility is that they have seen only a fraction of all the satellites associated with the Milky Way due to various observational biases. The issue remains unsolved. One of the motivations for the Subaru Strategic Survey using HSC is to do increase observations in the search for Milky Way satellites. The early data from this survey is what led to the discovery of Virgo I. This program will continue to explore much wider areas of the sky and is expected to find more satellites like Virgo I. These tiny companions to be discovered in the near future may tell us much more about history of the Milky Way's formation. "These are so-called "ultra-faint dwarf galaxies". However, previous searches made use of telescopes with a diameter of 2.5 to 4 meters, so only satellites relatively close to the Sun or those with higher magnitudes were identified." Ultra-faint dwarf galaxies close to the sun? For luminosity? Does the author understand the scale? Do you understand that they were obviously talking about the solar neighborhood? Duh. Solar Neighborhood? HA! "It lies at a distance of 280,000 light years from the Sun, and such a remote galaxy with faint brightness has not been identified in previous surveys." fyi - the earth is about 9 light MINUTES from the sun - and yeah, earth is in the "solar neighborhood". Well clearly we speak a different language. Look at the 3D graph above showing the various dwarf galaxies in proximity to the Milky Way. (Granted, a 2D image of a 3D graph is perplexing.) The gray oval in the middle is the Milky Way. It is apparent that gauging a distance, "relatively close to the sun" which is buried inside this small gray oval is confusing at best and shows a lack of understanding of the scale. As you mentioned, we're less than 10 light-minutes from the sun and the context is galaxies. It was pointed out in the paper ( preprint: https://arxiv.org...09.04346 ) that an object as faint as Virgo I couldn't be detected in the Sloan Digital Sky Survey unless it was within about 28 kpc (this is a heliocentric distance, obviously, since most all observations are made from somewhere along a circle centered around the sun with radius of just 1 AU). The limit for seeing such faint objects with Subaru/Hyper Suprime-Cam is about 89 kpc from the sun, so Virgo I was almost "too far from the sun" to be observed. As you've demonstrated, it's when you can see a 3-dimensional plot of the galactic neighborhood that distances other than heliocentric ones become noticeable. Since our sun is about 8kpc from the center of the Milky Way, it's confusing to relate distances to a dwarf galaxy that is over 10 times that distance away. It's relationship is to our galaxy, not our sun. However, I see your point that accuracy may be better served with this confusing explanation. provides important insights into galaxy formation through hierarchical assembly of dark matter. Once more the totally meaningless statement of insights that simply lead further up the creek. This observation reveals absolutely nothing about galaxy formation whatsoever. It might tell us about the current structures but in no ways does it reveal anything about how the galaxy[ies] came to be. Once again - the meaningless phrase simply indicates that the researcher(s) are still groping in the dark as fervently as before. So you think that researchers and science writers who clearly know more than you about the subject, were confused about where these things were located? This observation was made by pros who know a great deal more about galaxy formation than can be included in one article or paper or even the entire book of Genesis. This is implicit yes?